Sir John Tooley was commendably candid in prefacing his announcement of the competition result. He reflected that one of the fascinations of listening to singing is that it is a very personal matter and what one person may like another may not. It is the responsibility of a jury to arrive at a consensus that they believe to be just and fair, but he nonetheless found it a rather fearsome experience to deliver their verdict to a very knowledgeable audience such as was gathered in the Wigmore Hall. Having spent the adjudication interval listening to the views of a number of those opera going and Wigmore “regulars” it was clear that they had formed equally divergent views and a good many of them would have found themselves in dissenting camps. The award of Second prize was possibly the most contentious of the evening. Soprano Monica Bancos has a voice with a very distinctive timbre. It is very “closed” and certainly not to everyone’s taste. She has a very assured manner and presented both her programmes with complete inner conviction. On this all-soprano podium the Song Prize went to Angela Bic for Brahms’ Nicht mehr zu dir zu gehen and Quilter’s Love’s philosophy. I found her a well disciplined singer, presenting each piece with care and restraint, though with not as many words distinguishable as I would have liked. Her pianist, Robin Davis, was justifiably awarded the Accompanist’s Prize, though it should be noted that both the main prize winners were accompanied by Gary Matthewman, who is no longer eligible to compete for an award in this competition. The three other finalists all gave highly enjoyable performances, and I will comment on them in their order of singing. First on stage was Caroline MacPhie, who had put together the most enterprising programme, with a strong leaning towards music of the 20th century. 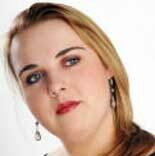 Her semi final selection included an aria from Tippett’s A Child of our Time, and in the final she sang arias from Janacek’s Cunning Little Vixen and Poulenc’s Les mamelles de Tiresias. She exploited her skills as a previous modern languages graduate and has a very pliant voice that seemed perfectly at home in everything that she sung. After the interval came Derek Welton, the baritone “thorn” amongst a bouquet of sopranos. His is a quality voice, if ever there was one, but I think he was just a shade below his best form on the evening. Nevertheless his performance of Ford’s aria E sogno? from Verdi’s Falstaff was a masterpiece of interpretation as a sequence of rapidly changing emotions were expressed with relish. Soprano Anna Devin was last on stage. A singer of great charm and elegance whose persuasive manner wins her many fans in the audience. I am always impressed by her fantastic diction that is particularly valuable in oratorio repertoire, but I enjoyed hearing her venture into bel canto territory with Elvira’s mad song from Act I of I puritani. Those three presented their programmes with a certain amount of showmanship and a clear indication of their acting abilities, skills that are much in demand in the opera profession these days, where the ability to stand mid stage and deliver a big aria can no longer be regarded as a passport to success. Many people expressed surprise at the elimination of Gerard Collett at the semi-final stage. I think it would be fair to describe this young baritone as a lieder specialist, whose performances of Schubert’s Wanderers Nachtlied II and Gounod’s Serenade had the audience spell bound. Other aspects of his programme were less successful, but he seems assured of a fine career on the concert platform. Finally a word about a small but significant alteration in the competition rules. The requirement, which so sadly caught out Eliana Pretorian last year, for a work by Bach or Handel in the semi-final has been modified to “an aria/song from the oratorio or concert repertory” leading to more varied choices. This change clearly won the undisputed approval of the audience.